A nutritious and economical reward for your dog! 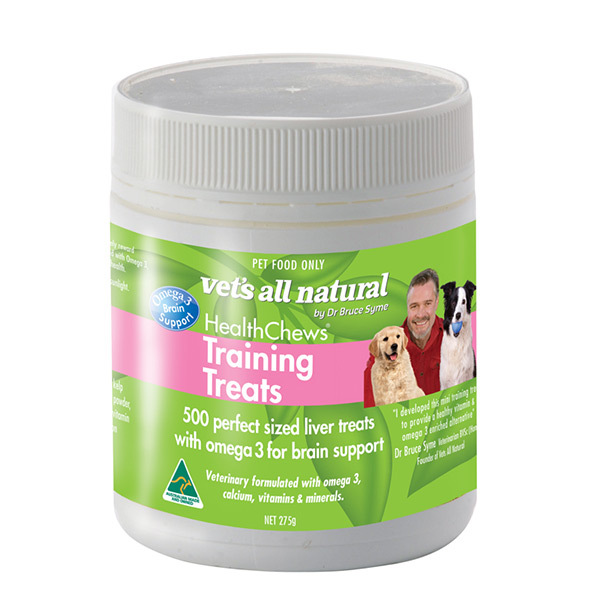 These treats are chock full of Omega 3 to enhance your dogs growth and health. They are liver flavoured and are packed with vitamins, minerals and antioxidants. Omega 3 is great for your dog's brain and so should be a perfect match for brain activities such as training. 500 treats per jar. Liver, Dolomite, Omega 3, Flax seed, Prebiotic, Kelp granules, Lecithin granules, Parsley powder, Barley grass powder, Milk thistle, Grape seed, Ginger, Green tea, Wheat germ, Vitamin C, Garlic powder, Colostrum powder, Zinc chelate, Boron chelate. Read 2 customer reviews of Vets All Natural Training Treats. The average customer rating is 4.5. My dog loves these and so do all the other dogs at the park!